Mumps (or mumps parotitis) is a viral illness often occurring in childhood, caused by the mumps virus. 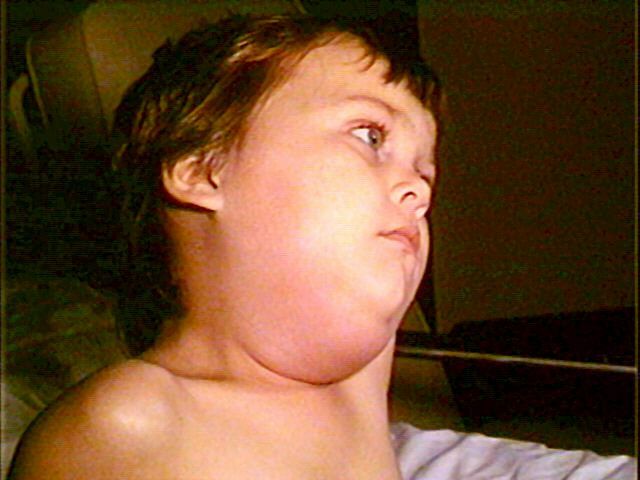 Mumps is an illness caused by the mumps virus that belongs to the Paramyxoviridaefamily. The virus enters the body through the upper respiratory tract. The virus usually only has a tropism limited to human beings. The virus is transmitted between human beings without contact being necessary. Viral particles can be excreted by the patient's saliva, contaminate the surrounding air and infect a new target. The targets are generally children, although adults can also be infected. The disease is more severe in adults. The respiratory tract infection is initially asymptomatic. The virus then spreads in the blood and colonises the whole body. The initial symptoms only develop in the salivary glands after a long incubation period (three weeks) this produces uni or bilateral parotitis (an infection of the largest salivary gland, the parotid gland). In addition to the salivary glands the virus can develop in all glandular organs including the ovaries, testes (which may cause sterility), pancreas, kidney or even central nervous system causing meningitis or encephalitis. The treatment is mainly symptomatic: it does not directly target the virus. There is, however, a preventative vaccine which is often given in combination with vaccines against rubella and measles.